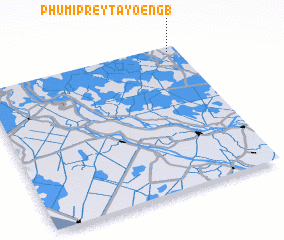 Phumĭ Prey Ta Yœ̆ng (1) is a town in the Svay Riĕng region of Cambodia. An overview map of the region around Phumĭ Prey Ta Yœ̆ng (1) is displayed below. Where is Phumĭ Prey Ta Yœ̆ng (1)? Visiting Phumĭ Prey Ta Yœ̆ng (1)?